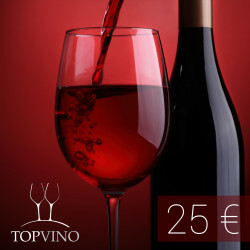 Delight yourself or your loved ones, or business partner with 25 Euros gift voucher to purchase anything in our store topvino.sk. Delight yourself or your loved ones, or business partner with 50 Euros gift voucher to purchase anything in our store topvino.sk. Delight yourself or your loved ones, or business partner with 100 Euros gift voucher to purchase anything in our store topvino.sk. Delight yourself or your loved ones, or business partner with 200 Euros gift voucher to purchase anything in our store topvino.sk.